The last few weeks I have experienced, or been told about, a few quirks of nature that are worth retelling. The first occurred on a fishing trip with a mate, Gary Berson. When fishing, he often calls me the Gurnard King, as I have an uncanny knack of catching these spiny, ugly fish. Although they may be tasty to eat, we always carefully release them rather than attempt to deal with their many sharp, poisonous spines. So when Gary started complaining about what he had brought to the surface, I immediately thought Gurnard, but it was worse still, an Eel which had made a disgrace of his rig and so he had to cut the lot off. Later, while filleting, I first thought that the Dhufish had worms inside, but on closer inspection it was revealed to be hundreds of baby eels. Two weeks later another Dhufish was found to have the same, which I have never seen before. Then, while chatting on the verandah one afternoon, my son announces that he has seen the most unusual occurrence at Gracetown main beach that day, a black swan swimming in the sea. Only once before have I ever seen this at Gracetown many years ago and then, by sheer coincidence, as we are discussing this ‘freak’ of nature, the black swan flies directly across our verandah, heading inland again. While on birds, there are normally a few Kookaburras around our property, but a few weeks ago there were so many we lost count and they were extremely active. With one of the best known sounds of the Australian bush, this was not just their regular laughter at dawn and dusk, but a cacophony of cackling chuckles and hoots throughout the day. Apparently the simple explanation was they were in a breeding cycle and this activity was a territorial display. But the coup de grace was revealed by Arthur Armstrong on one of his regular visits to feed our chook, Debbie. On arrival Arthur, asks if we have heard about what he and Shane Carvill had witnessed that day. I told Arthur that indeed we had not, because he is our source of information throughout the town and had only just arrived. 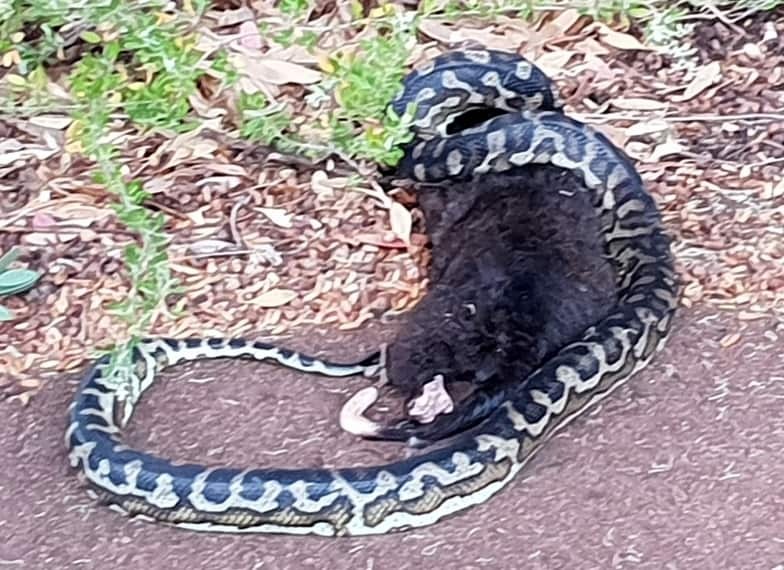 With an explanation that only those who have chatted with Arthur can appreciate, he tells an amazing story of witnessing a carpet python devouring a reasonable sized possum. Now Arthur can tell a yarn or twenty, so at first I am just a little bemused, but having once seen video of an Anaconda eating a whole antelope, anything is possible. So I contact Shane and he sent me the attached photo, that does not really quite do justice to the event, but certainly shows that snakes are commonly able to consume prey many times larger than themselves. This is not due to a dislocation of the jaw as many suspect, but simply because they have elasticised ligaments connecting the jaw and also the ability of their skin to stretch way beyond the normal range. Nature at work indeed!